The Carlisle Sports Emporium has long been a must-visit favorite in the Cumberland Valley. And why not? There’s really something for everyone! Go-karts, batting cages, roller skating, laser-tag, rock-climbing, mini-golf, and a large indoor arcade are just some of the fun activities at the Sports Emporium. With recent renovations and additions, the Carlisle Sports Emporium can be an all-day adventure. Start your day by exploring one of the largest arcades in Central Pennsylvania. Enjoy over 100 games, including the classics like Space Invaders, racing games like Dayton 500, and pop-culture themed ones like Batman, Jurassic Park, and Terminator. Compete against your friends and family with basketball nets, Ski ball, and craziest air hockey I’ve ever played. The arcade is perfect for all ages and occasions. Practice your swing at the recently upgraded batting cages at the Sports Emporium with new adjustable speeds and adjustable heights. You can try your luck with fast pitch, slow pitch, and even a 70 MPH cage. After you’ve got your arms warmed up, bring your group over to the mini-golf area for your choice of a Castle or Western themed course. 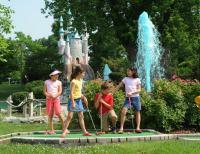 Each hole presents a unique and wacky challenge for every golfer. You don’t need to go far to take a break for lunch, as the Victory Lane Café at the Sports Emporium has a number of options. Order a pizza or a combo for your group and don’t forget about dessert. You can find their full menu here. After lunch, swap out your shoes for a pair of roller blades and check-out the matinee skate from 1 pm-3:45 pm. Matinee Skating is available on Saturday and Sunday, while private rentals are available throughout the week and after 4 pm on the weekend. There’s also an evening skate from 7-9:30 pm on Saturdays. My personal favorite at the Sports Emporium is the 7,500 sq. ft. laser tag zone, Lasertron. Drop into a futuristic world where the only light is from the glowing pillars and arches, and the lasers shooting at you. Aim for your opponents or their base and rack up the points. Lastertron has two floors, which allows plenty of room to hide and strategize. Each session is 40 minutes long. Climbing “The Rock” at Sports Emporium doesn’t mean climbing Dwayne Johnson, but it does mean climbing in a computerized wall. Test your strengths with these simulated hikes! Your racing adventure awaits with three tracks, including a newly improved Outdoor Grand Prix track. The Grand Prix track is ¼ mile long and offers new twists and turns and features to new LED karts that are more powerful and unique. End the day on the Indoor Track, which includes children’s “Rookie Carts” and a FasTrack for adults. Once you reach the finish line and experienced your day at the Carlisle Sports Emporium, it’s time to waive the checkered flag. Whether you’re bringing children for a family day out, celebrating a birthday, taking the office for team building, planning an amusing date night, or just looking for an excuse for a fun day, the Sports Emporium has you covered.